To me Venice (or Venezia in Italian) is one of those cities that I always dreamed of going to, but it remained in that state - a dream. Far fetched. Never gonna happen. Sorry Charlie. Ain't a possibility. Too bad. So sad. 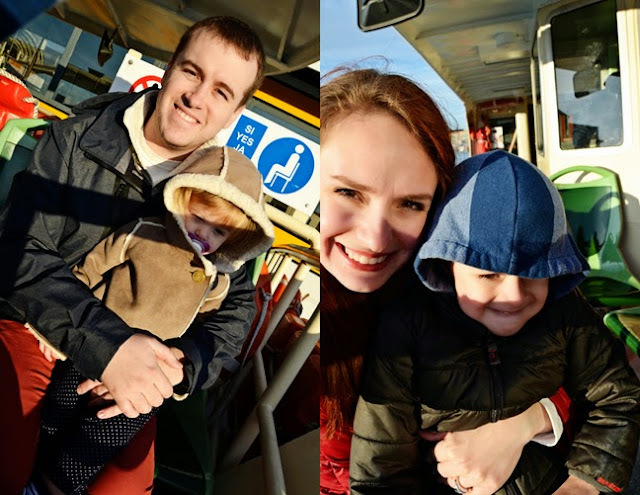 And then we moved to Germany and Venice became a 6 hour drive away instead of a 14 hour flight with jetlag and all that comes with far, far away traveling! We had a 4-day weekend after Christmas so as soon as Chris got home from work we loaded up the car and headed down to Italy! So many fun cities to see on two signs! Vienna (Wien), Salzburg, Verona, and more! The drive through southern Germany and all of Austria was immaculate. And then we drove up into the mountains and it started raining. Once we got higher up in altitude it quickly turned to snow. 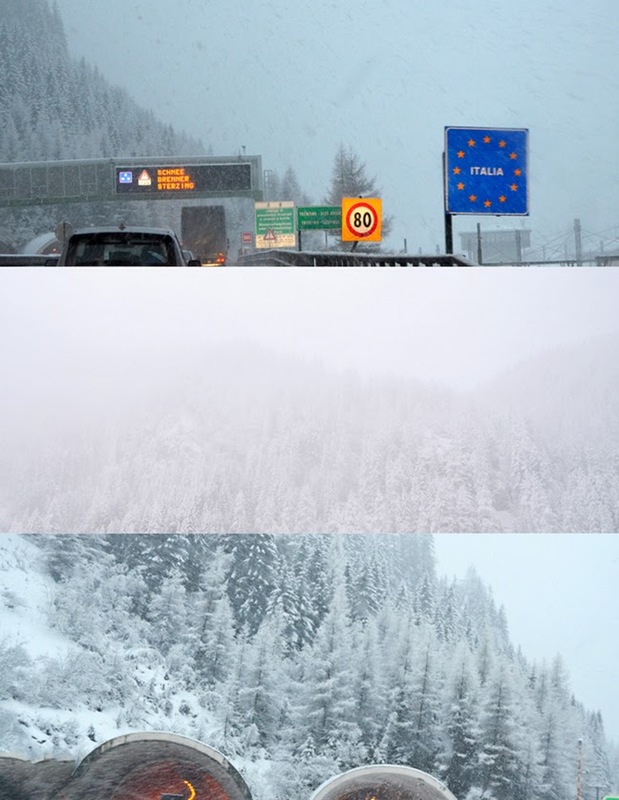 Chris loves snow so he was in heaven, but I was like, isn't Italy supposed to be warm and sunny and nice!? Here's the sign welcoming us to Italy! Woohoo! Holy toll roads, Batman! Let's just say driving in Italy is EXPENSIVE! We made it to the Army Ederle hotel in Vicenza! 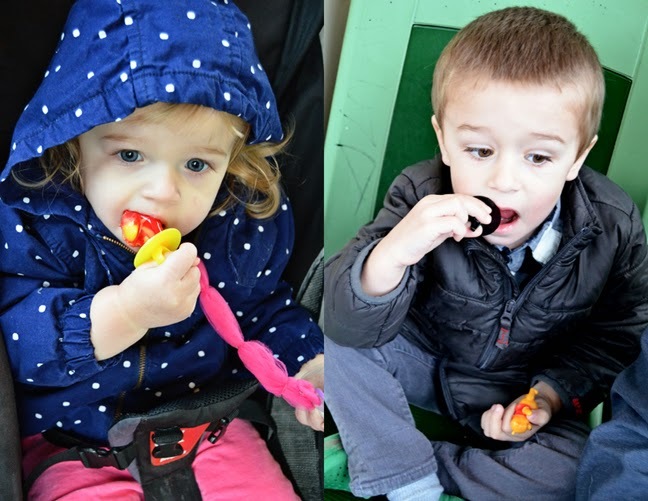 The base is centrally located between all the cities we wanted to go to, it worked out perfectly. We unpacked, bathed the kids, put them to sleep, watched a couple episodes of Scrubs, then went to sleep, ready for our adventure to Venice in the morning! Venice is a car-free urban wonderland of a hundred islands - laced together by 400 bridges and 2000 alleys. Born in a lagoon 1500 years ago as a refuge from barbarians, Venice welcomes millions of visitors every year, and is slowly sinking! To build the foundation for the city that reaches down beneath the mud to the solid clay, more than a million trees were piled together. Much of the surrounding countryside was deforested by the Venetians. 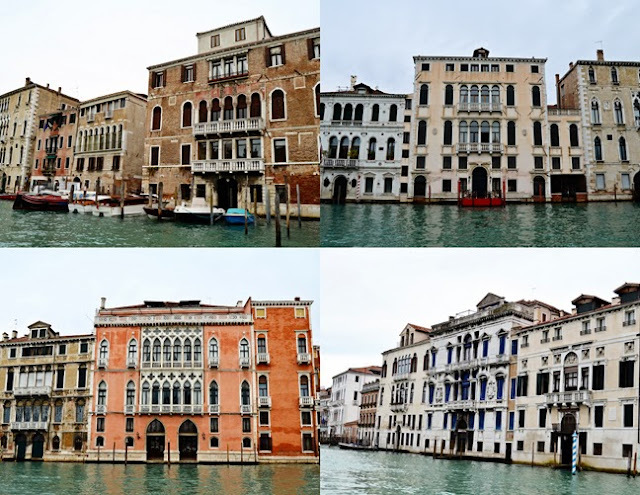 Trees were imported and consumed locally to fuel the furnaces of Venice's booming glass industry, to build Europe's biggest merchant marine, to form light and flexible beams for nearly all the buildings in town, and to prop up this city in the mud. In the Middle Ages, the Venetians became Europe's clever middlemen for East-West trade and created a great trading empire. 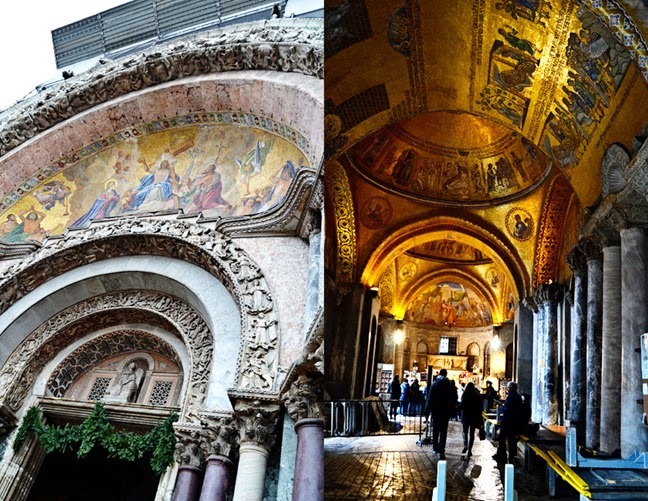 By smuggling in the bones of St. Mark (San Marco) in AD 828 Venice gained religious importance as well. With the discovery of America and new trading routes to the Orient, Venetian power ebbed. But as Venice fell, her appetite for decadence grew. Through the 17th and 18th centuries Venice partied on the wealth accumulated through earlier centuries as a trading power. 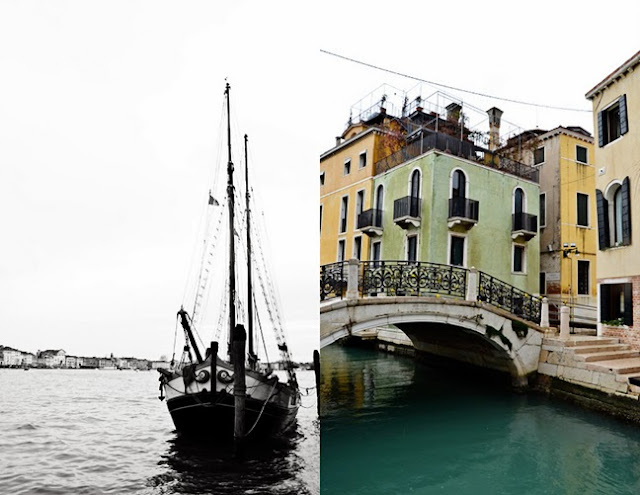 Today, Venice is home to 58,000 people in its old city, down from about twice that number just three decades ago. Here's a picture looking out over the water as we crossed the one and only bridge to get into Venice. We parked in the big Tronchetto parking garage. With our trusty Rick Steves guidebook in hand, it told us to cross the street and look for signs for the ACTV - we did just that and found it, no problem! 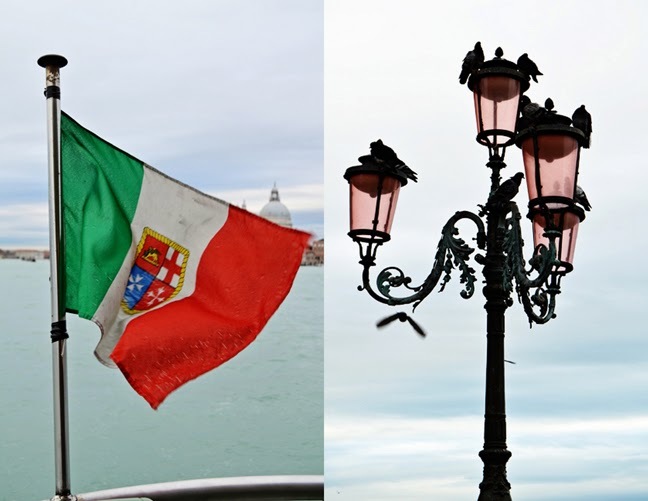 We admired all the pretty boats and then found the Hello Venezia booth to buy our vaporetto tickets and museum passes. 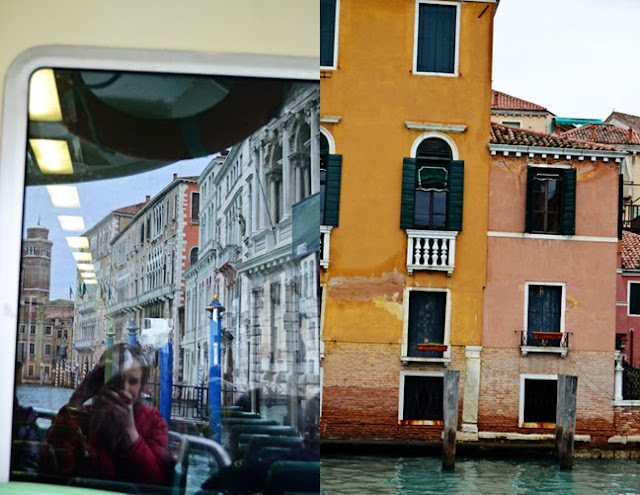 Like the metros in Budapest, Prague, and Vienna, Venice has its own public transit system: Vaporetti! Boats! So unique! They work like city buses except they never get a flat, the stops are docks, and if you get off between stops, you might drown. You also have to validate your ticket every single time you get on, unlike the metro where you only have to validate once. Inspectors did come by about four times to make sure our passes were valid. Helpful electronic boards displayed which boats were coming next and when, and where to, so we were easily able to navigate around this magnificent city. The secret to good behavior: suckers. And our boat ride began!! 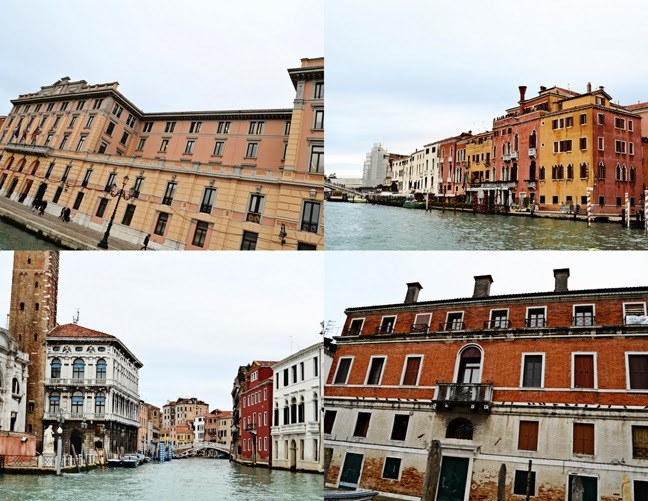 We were already so enchanted with Venice and the beautiful buildings! 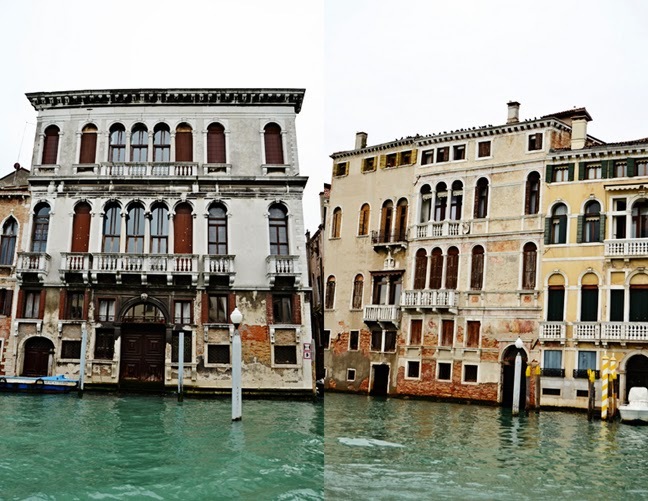 Venice is a city of palaces, dating from the days when the city was the world's richest. 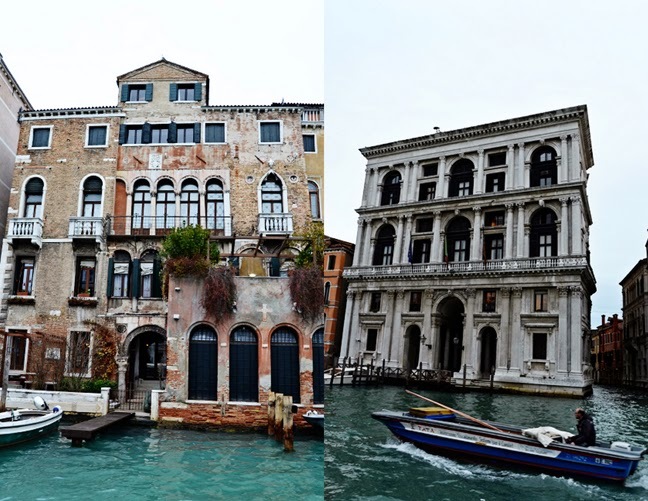 The most lavish palaces formed a grand architectural can-can along the Grand Canal. Once frescoed in reds and blues, with black-and-white borders and gold-leaf trim, they made Venice a city of dazzling color. We immediately crossed under a few bridges. There are only four bridges that cross the Grand Canal (the main river through town). 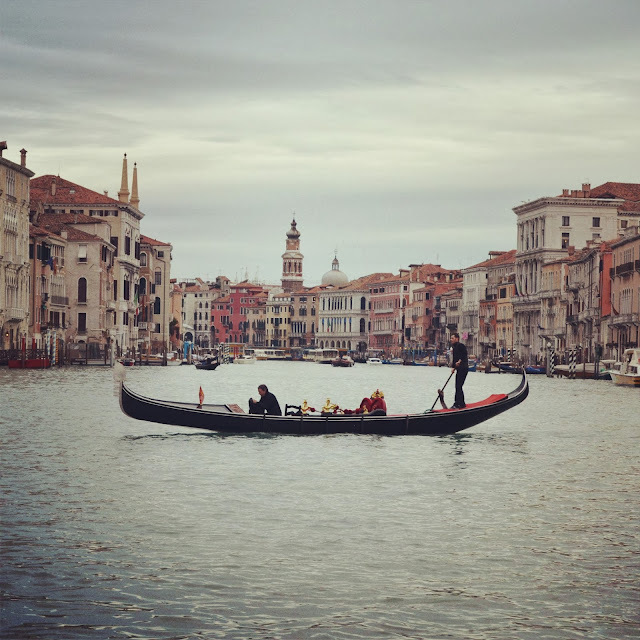 The Grand Canal is Venice's "Main Street." 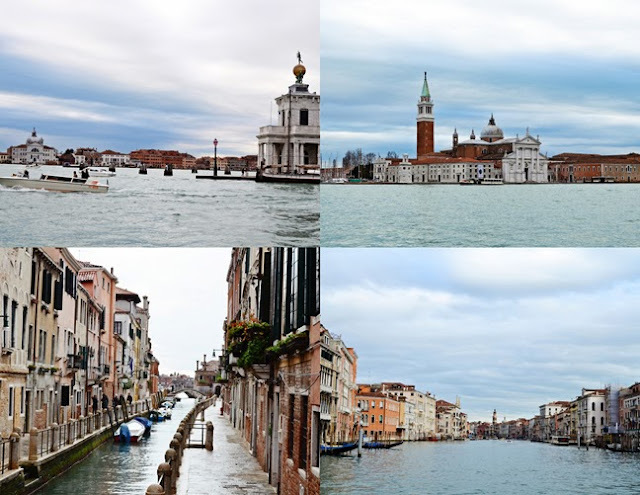 At more than two miles long, nearly 150 feet wide, and nearly 15 feet deep, it's the city's largest canal, lined with its most impressive palaces. It's the remnant of a river that once spilled from the mainland into the Adriatic. The sediment it carried formed barrier islands that cut Venice off from the sea, forming a lagoon. Venice was built on the marshy islands of the former delta, sitting on wood pilings driven nearly 15 feet into the clay (alder was the preferred wood). About 25 miles of canals drain the city, dumping like streams into the Grand Canal. We were told to be prepared to splurge. Venice is expensive for its residents as well as tourists because everything must be shipped in and boated to its destination. Even UPS and DHL have their own boats! I can't imagine trying to move in and out with all of your belongings, let alone trying to get things from IKEA! What a strange place to live right?! 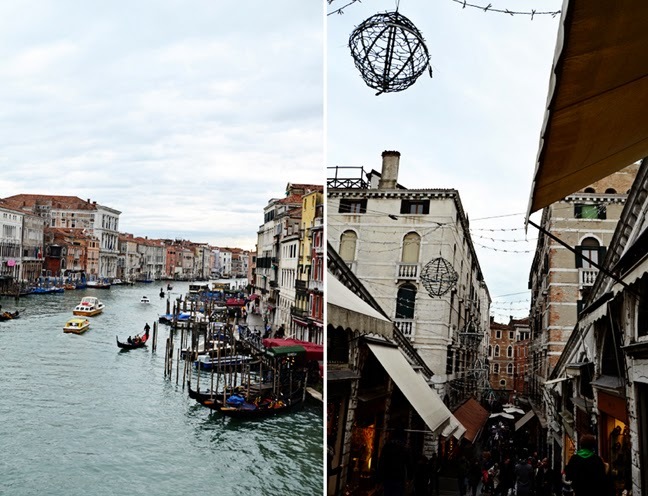 We decided to go on Rick Steves' "Grand Canal Cruise" to get our bearings. It started at the Ferrovia stop where we saw the Santa Lucia train station - one of the few modern buildings in town (it was built in 1954). It's been the gateway into Venice since 1860 when the first station was built. More than 20,000 people a day commute in from the mainland making this the busiest part of Venice during rush hour. Opposite the train station is the green domed San Simeon Piccolo church. St. Simeon waves ciao to whoever enters or leaves the city. This is the Church of the Scalzi (Church of the Barefoot, named after the shoeless Carmelite monks) where a late doge (Venetian ruler) rests. Currently under renovation, boo. The San Geremia - the edifice is popular as the seat of the cult of Saint Lucy of Syracuse, whose remains are housed inside. 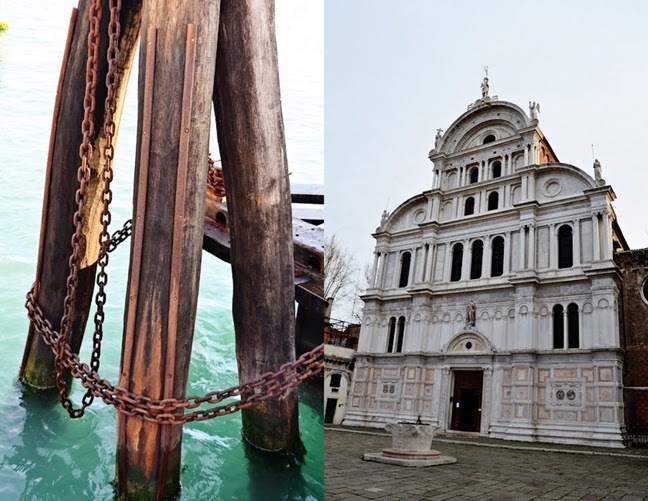 The unfinished church of San Marcuola, one of only five churches fronting the Grand Canal. It's a church dedicated the saints Hermagoras and Fortunatus. 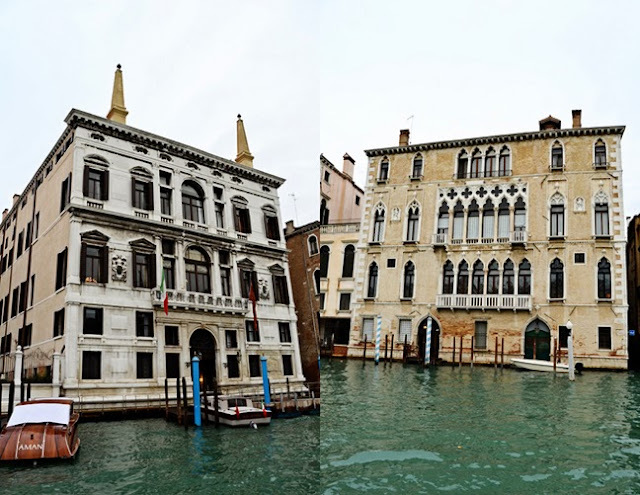 The stately gray Turkish "Fondaco" Exchange, one of the oldest houses in Venice. Its horeshoe arches and roofline triangles and dingleballs are reminders of its Byzantine heritage. Turkish traders in turbans docked here, unloaded their goods into the warehouse on the bottom story, then went upstairs for a homestyle meal and a place to sleep. Today the building contain's the city's Museum of Natural History - and Venice's only dinosaur skeleton. 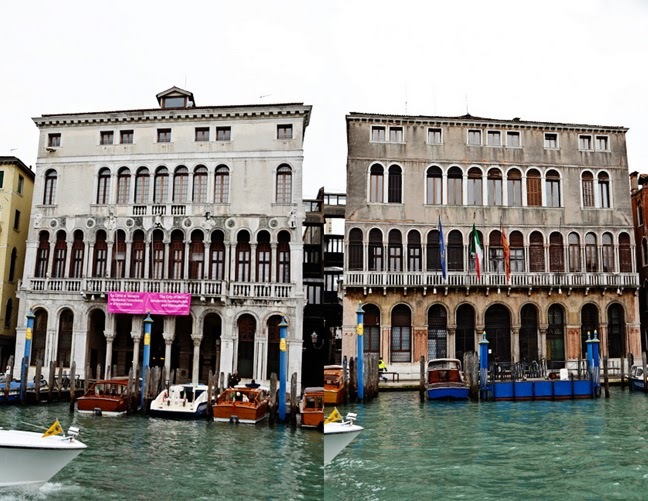 Venice's Casinò is housed in the palace where German composer Richard Wagner died in 1883. 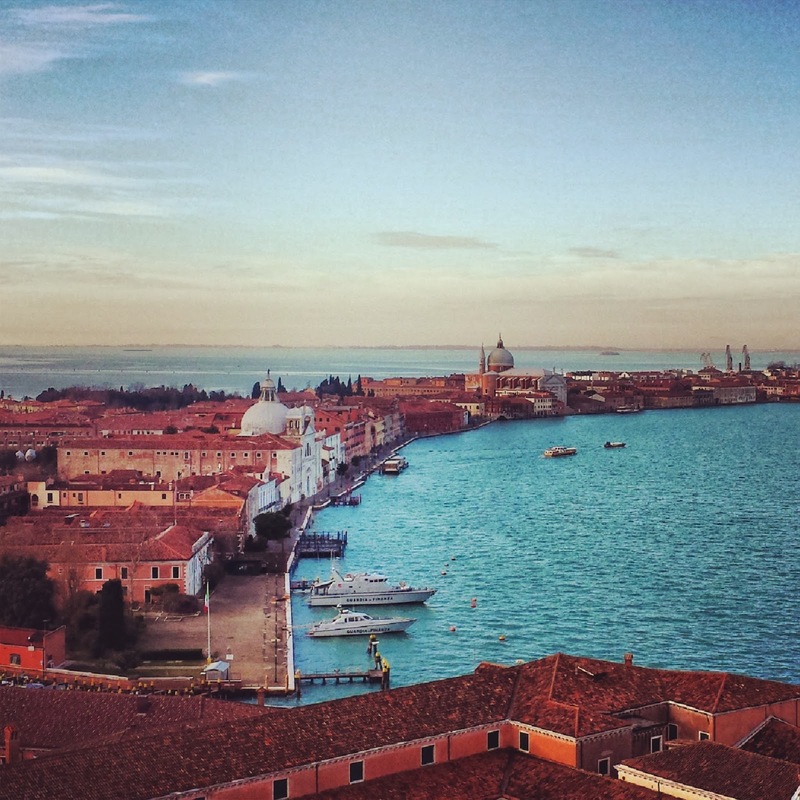 In the 1700s, Venice was Europe's Vegas with casinos and prostitutes everywhere. Casinòs ("little houses" in Venetian dialect) have long provided Italians with a handy escape from daily life. Today they're run by the state to keep Mafia influence at bay. The fancy front porch rolling out the red carpet is for high rollers arriving by taxi or hotel boat. We sat in the back of the boat and I was all around, up and down, back and forth, trying to take pictures as we went along. I'm sure this guy thought I was a total nuisance by the time we got off... Sorry pal! The Ca' Pesaro which houses the International Gallery of Modern Art. "Ca'" is short for "casa" (house). Because only the house of the doge (Venetian ruler) could be called a palace all other Venetian palaces are technically "Ca'." In this city of masks (which we saw EVERYWHERE while walking along the streets!) the rich marble facades mask what are generally simple, no-nonsense brick buildings. Most merchants enjoyed showing off, but being smart businessmen, only decorated the side of the buildings that would be seen and appreciated. But the Ca' Pesaro is the only building with a fine side facade as well! Shortly after the Ca' Pesaro is the glorious triple-decker medieval arcade of the Ca' d'Oro. 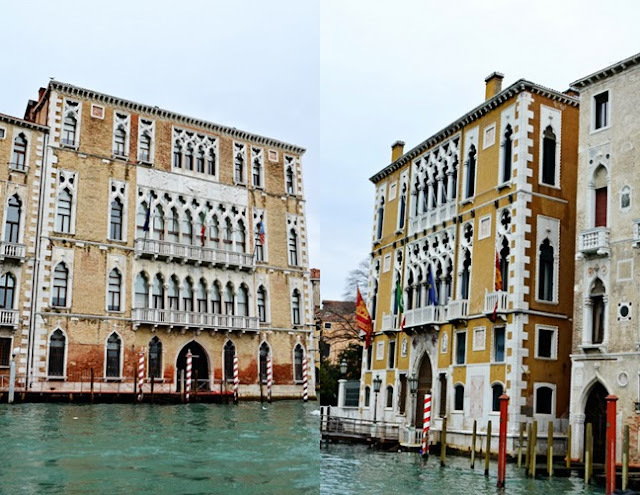 The lacy Ca' d'Oro (House of Gold) is the best example of Venetian Gothic architecture on the canal. Its three stories offer different variations on balcony design, topped with a spiny white roofline (which, if you look carefully, a bird was perched on practically every spine, lol). Venetian Gothic mixes traditional Gothic (pointed arches and round medallions stamped with a four-leaf clover) with Byzantine styles (tall, narrow arches atop thin columns) filled in with Islamic frills. Like all the palaces, this was originally painted and gilded to make it even more glorious than it is now. Today the Ca' d'Oro is an art gallery. We passed the open-air produce market. It bustles in the morning but is quiet the rest of the day. Since we were sitting in the back, we passed under the Rialto Bridge before we could see it. The Rialto Bridge! A major landmark in Venice, the Rialto Bridge is lined with shops and tourists. Constructed in 1588, it's the third bridge built on this spot. Until the 1850s this was the ONLY bridge crossing the Grand Canal. 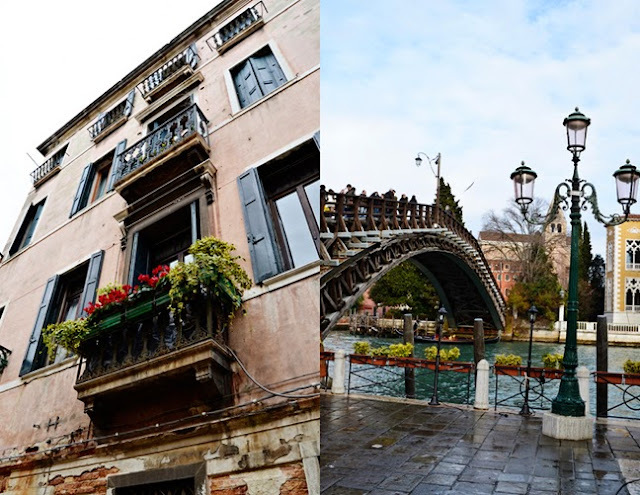 With a span of 160 feet and foundations stretching 650 feet on either side, the Rialto was an impressive engineering feat in its day (no kidding!). Earlier Rialto Bridges could open to let big ships in, but not this one. When this new bridge was completed much of the Grand Canal was closed to shipping and became a canal of palaces. 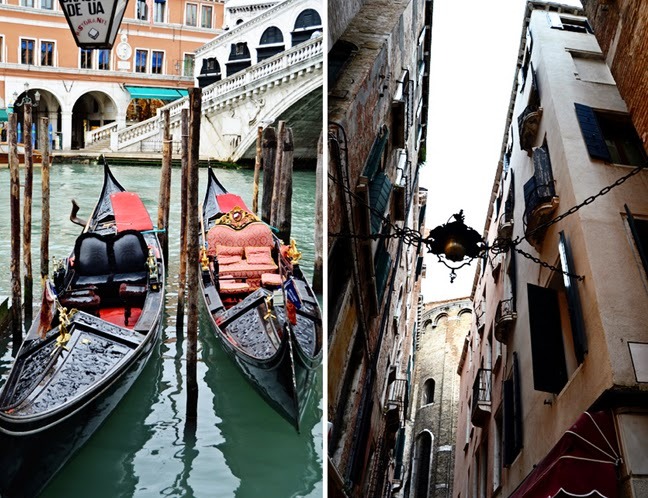 Venice's sleek, black, and graceful gondolas are a symbol of the city. 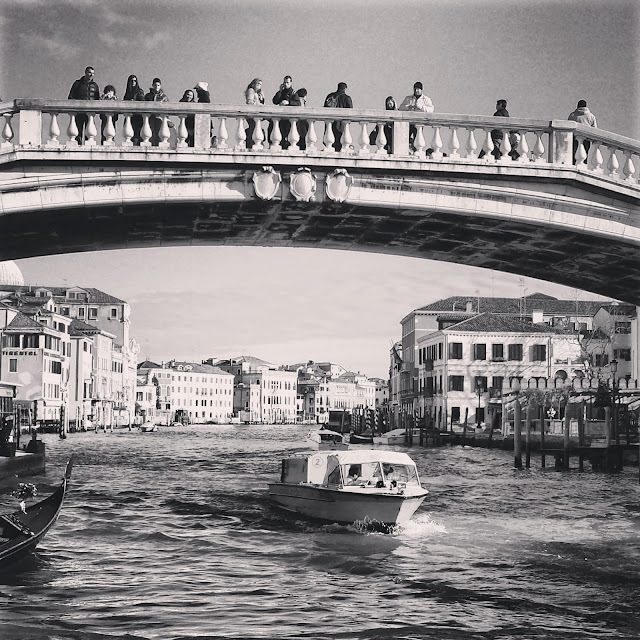 With about 500 gondoliers joyriding amid the churning vaporetti, there's a lot of congestion on the Grand Canal, but we never saw an accident! My favorite photo of Venice. The streets lining the Rialto Bridge. These two gray-colored palaces are the City Hall and the mayor's office. Their horseshoe-shaped, arched windows are similar and their stories are the same height, lining up to create the effect of one long balcony. Then we entered a long stretch of important merchants' palaces, each with proud, different facades. Because ships couldn't navigate beyond the Rialto Bridge, the biggest palaces - with the major shipping needs - line this last stretch of the navigable Grand Canal. Many buildings have a foundation of waterproof white stone upon which the bricks sit high and dry. Many canal-level floors are abandoned as the rising water level takes its toll. The posts - historically painted gaily with the equivalent of a family coat of arms - don't rot underwater, but the wood at the waterline where it's exposed to oxygen does. 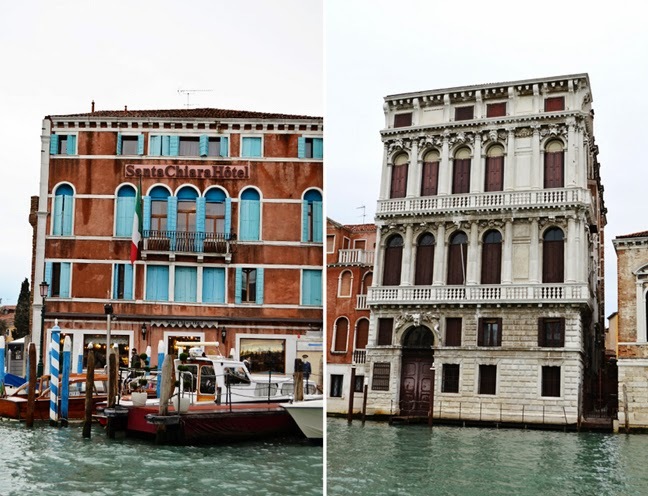 The impressive Ca' Foscari, with a classic Venetian facade dominates the bend in the canal. 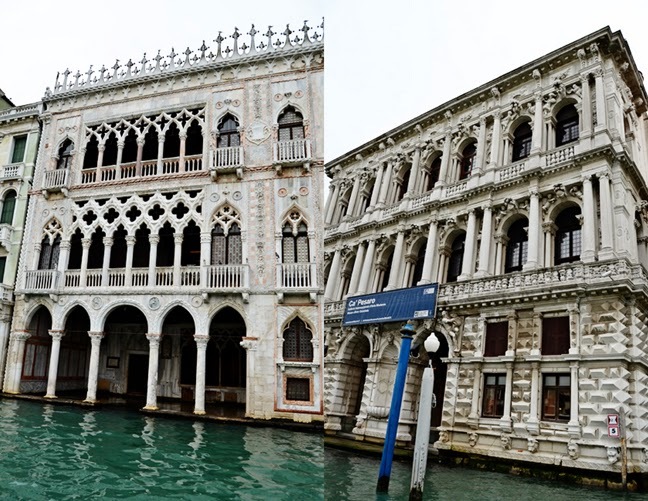 This is the main building of the University of Venice which has about 25,000 students. The grand, heavy, white Ca' Rezzonico houses the Museum of 18th-Century Venice. The San Samuele vaporetto stop with a church and bell tower in the background. 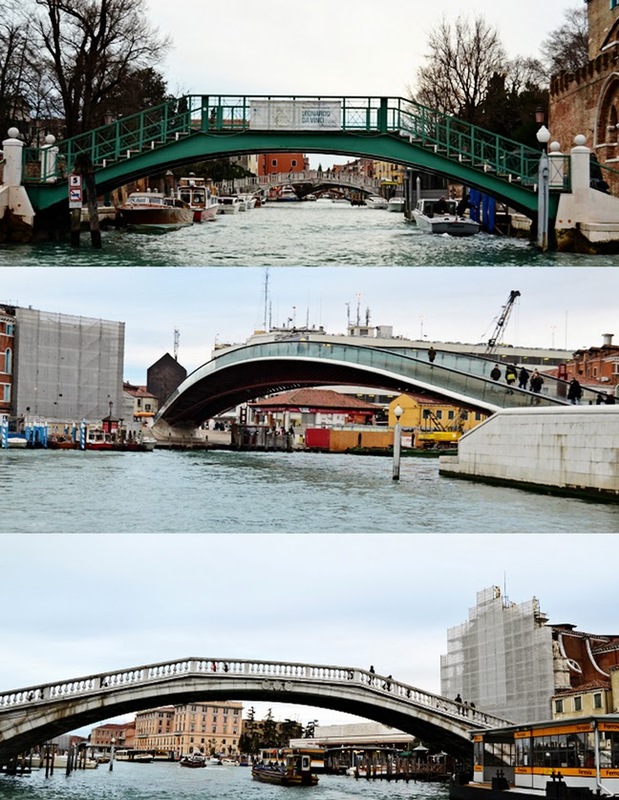 The Accademia Bridge was put up in 1934 as a temporary structure. Locals liked it, so it stayed. It was rebuilt in 1984 in the original style. The Accademia Gallery - filled with the best Venetian paintings. This low, white building among greenery is the Peggy Guggenheim Collection. The American heiress "retired" here, sprucing up a palace that had been abandoned in mid-construction. Peggy willed the city her fine collection of modern art. Palazzo Dario has a great set of characteristic funnel-shaped chimneys. These forced embers through a loop-the-loop channel until they were dead - required in the days when stone palaces were surrounded by humble, wooden buildings, and a live spark could make a merchant's workforce homeless. The Salviati building which once served as a glassworks. Its fine mosaic, done by Art Nouveau in the early 20th century, features Venice as a queen being appreciated by the big-shots of society. The La Salute Church, topped by a crown-shaped dome supported by scrolls. 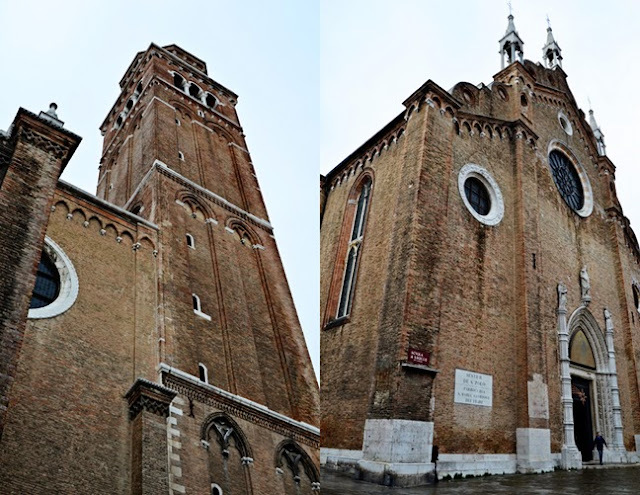 This Church of Saint Mary of Good Health was built to thank God for delivering Venetians from the devastating plague of 1630 which had killed about a third of the city's population. 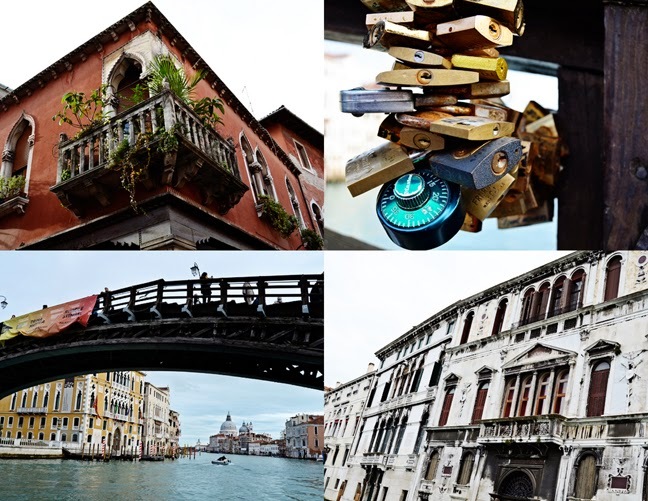 As the Grand Canal opens up into the lagoon the last building with the golden ball is the 17th-century Customs House which now houses the Punta della Dogana Museum of Contemporary Art. Its two bronze Atlases hold a statue of Fortune riding the ball. Arriving ships stopped here to pay their tolls. 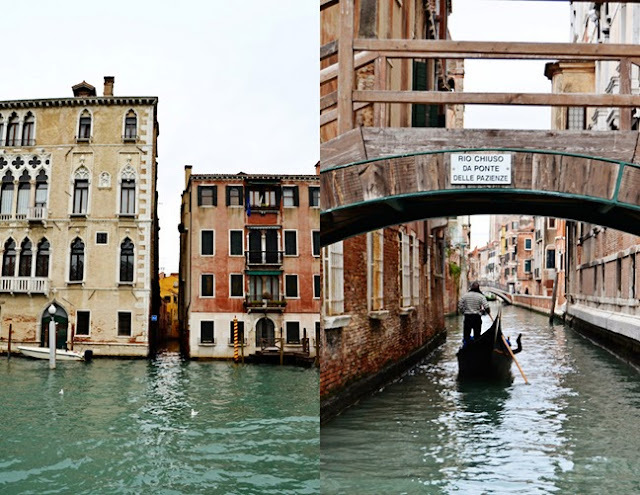 More pretty views of Venice. St. Mark's Square. 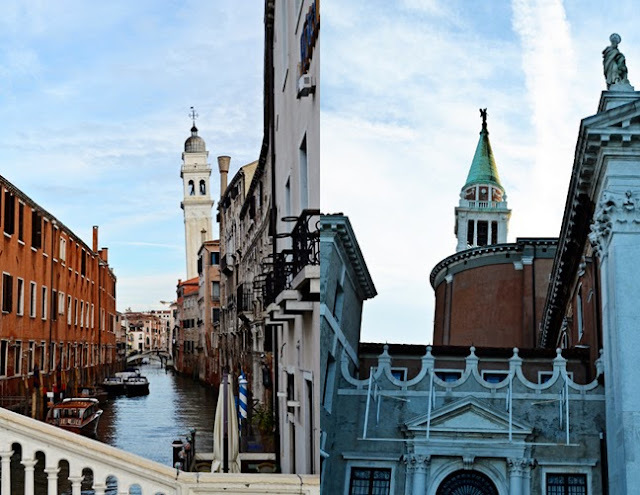 The political and religious center of Venice. The Italian flag on the back of the vaporetto we rode. / Pink lamps! We got off at the San Zaccaria stop and backtracked to St. Mark's Square. 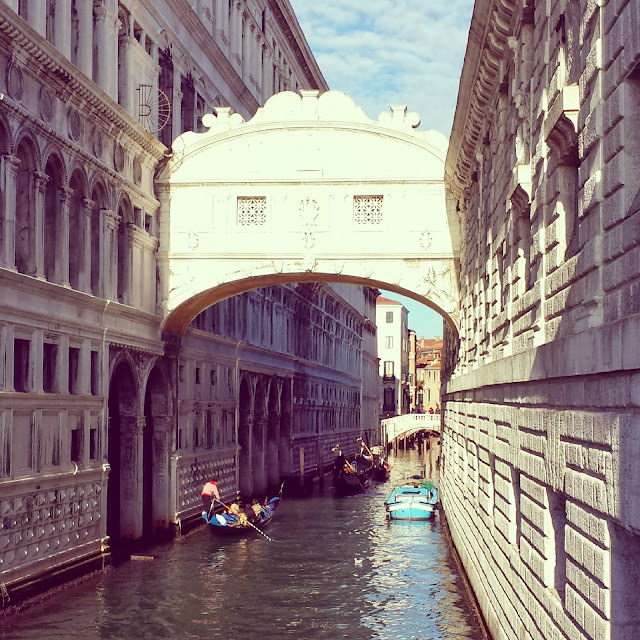 We passed the Bridge of Sighs. 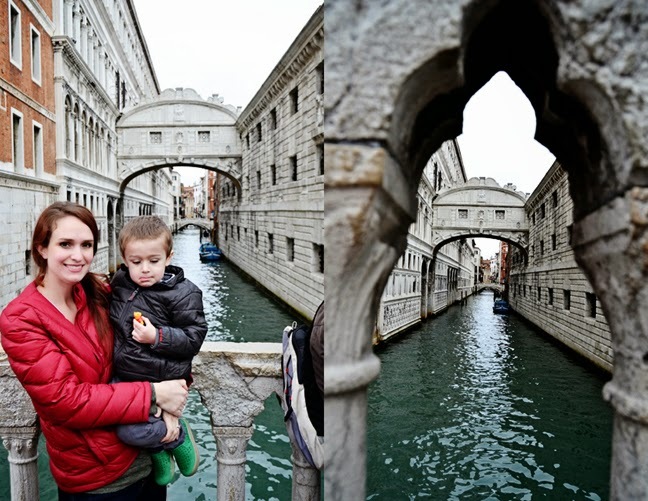 This bridge connects the Doge's Palace with the prison. Supposedly, a condemned man would be led over this bridge on his way to the prison, take on last look at the glory of Venice, and sigh. 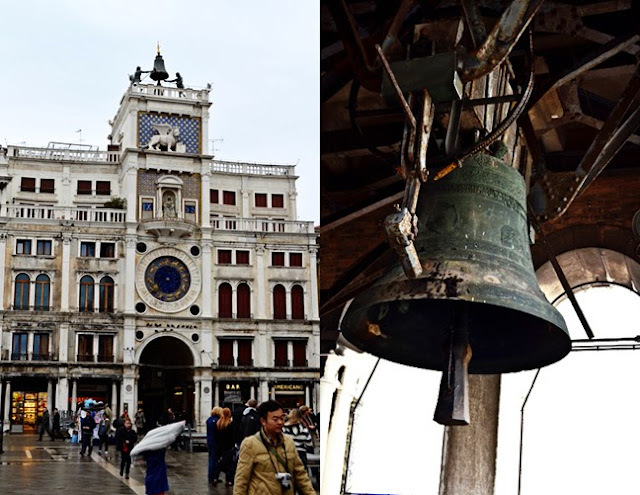 The Clock Tower, St. Mark's Basilica, and part of the Doge's Palace. 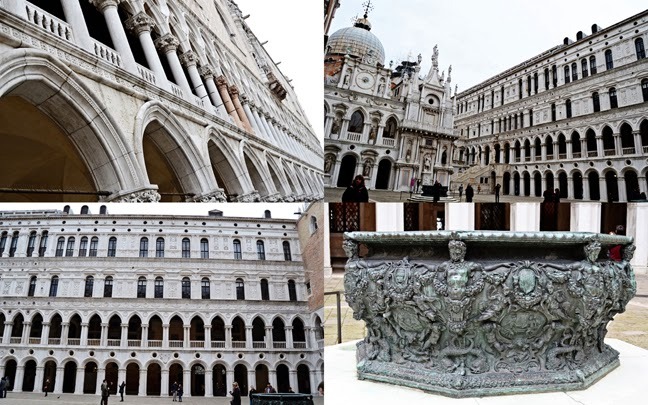 St. Mark's Square - this grand square is surrounded by splashy, historic buildings and sights: St. Mark's Basilica, the Doge's Palace, the Campanile Bell Tower, and the Correr Museum. 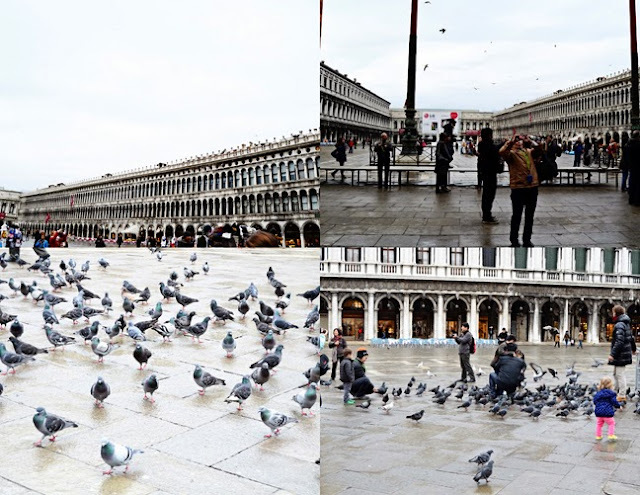 The square is filled with music, lovers, and pigeons. Nearly two football fields long, it's a rare large open space in the city. Fox and Jane were a little restless after being in the boat for an hour so we let them run around St. Mark's Square and chase the pigeons. They were in HEAVEN! The Clock Tower built during the Renaissance in 1496 marks the entry to the main shopping drag. The bronze men (Moors) swing their huge clappers at the top of each hour. 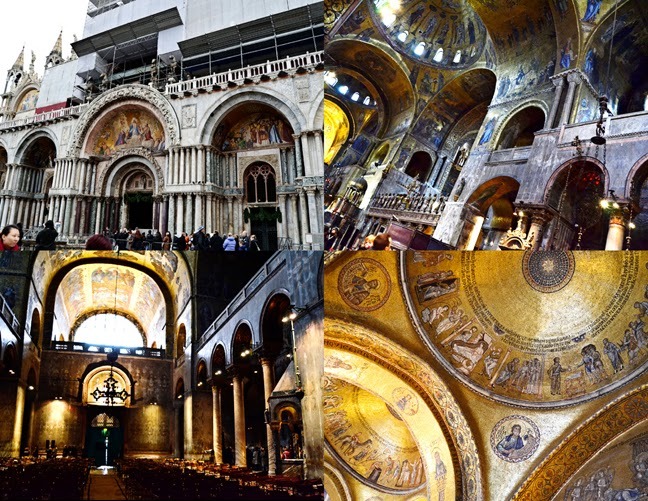 Then we went into St. Mark's Basilica. Built in the 11th century to replace an earlier church, this basilica's distinctly Eastern-style architecture underlines Venice's connection with Byzantium (which protected it from the ambition of Charlemagne and his Holy Roman Empire). It's decorated with booty from returning sea captains - a kind of architectural Venetian trophy chest. 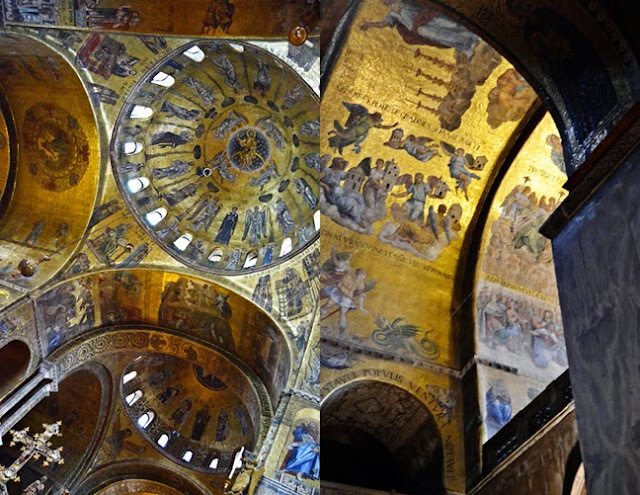 The interior glows mysteriously with gold mosaics and colored marble. Since about AD830, the saint's bones have been housed here. I could write pages about what everything is and means, but truly, you just have to see it in real life to believe. It's amazing. Then we went to the top of the Campanile Bell Tower. 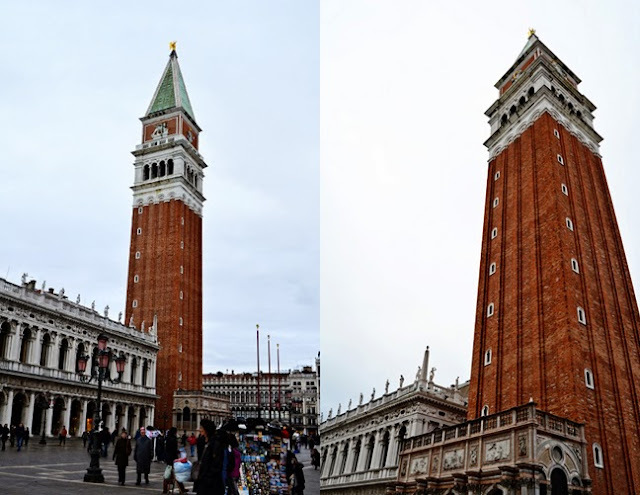 This dramatic bell tower replaced a shorter tower, part of the original fortress that guarded the entry of the Grand Canal. That tower crumbled into a pile of bricks in 1902, a thousand years after it was built. We rode the elevator 325 feet up to the top. 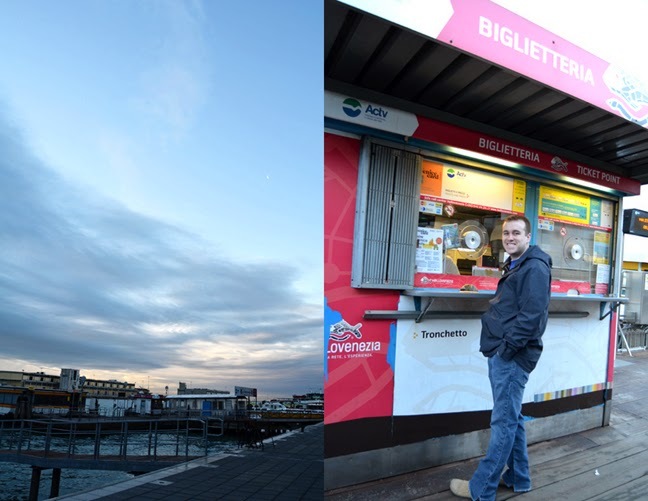 We asked a random dude to take our picture - thankfully he obliged! Here we are at the top of the tower - our only picture of all of us in Venice. 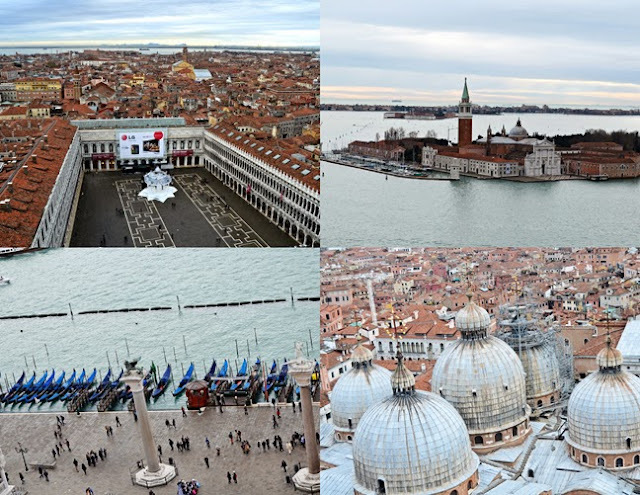 Top left: St. Mark's Square. 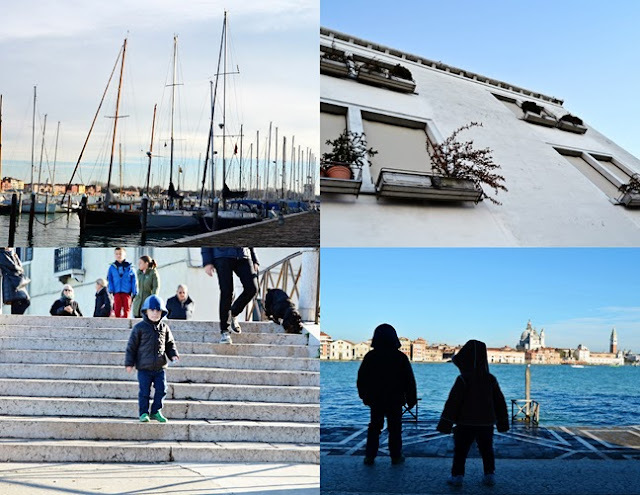 Top right: San Giorgio Maggiore island. Bottom left: Gondolas at the St. Mark's stop. Bottom right: St. Mark's Basilica from above. 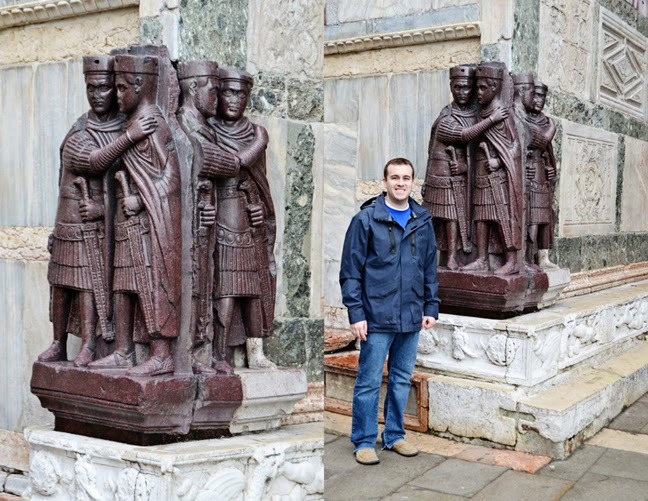 Chris (the art history nerd) was super excited to find the Four Tetrarchs on the exterior corner of St. Mark's Basilica. The Portrait of the Four Tetrarchs is a porphyry sculpture group of four Roman emperors dating from around 300 A.D. Since the Middle Ages it has been fixed to this corner. It probably originally formed part of the decorations of the Philadelphion in Constantinople. Next we took a tour of the Doge's Palace. The seat of the Venetian government and home of its ruling duke, or doge, this was the most powerful half-acre in Europe for 400 years. 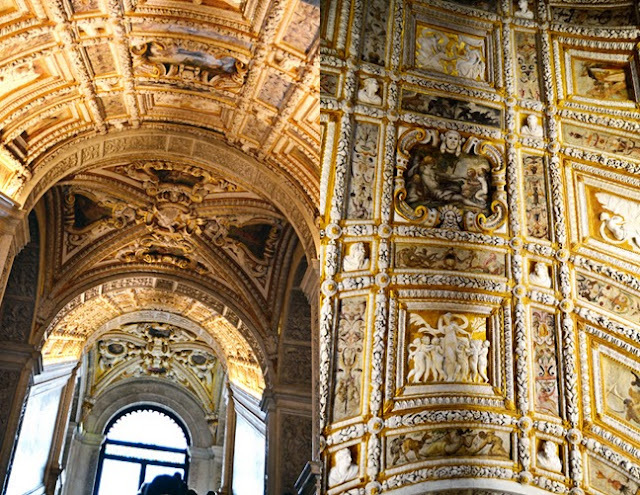 The Doge's Palace was built to show off the power and wealth of the Republic. The doge lived with his family on the first floor, near the halls of power. 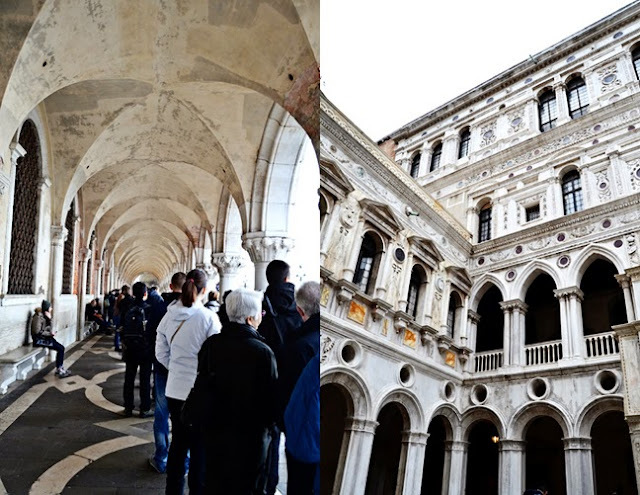 Long line to get in the Doge's Palace. / Such lovely detailed buildings in the interior courtyard. In the courtyard we found the grand staircase. Since 1567, the Giants’ Staircase is guarded by Sansovino’s two colossal statues of Mars and Neptune, which represents Venice’s power by land and by sea and therefore the reason for its fame. The decorations on the ceiling of the Golden Staircase are... I can't even describe. So detailed and ornate and fantastic. The ceilings in our apartment are just flat and painted plain white. Again, no pictures allowed, but this time I didn't see anyone breaking the rules so I followed suit and this picture is from the internet. The Senate Hall is a HUGE room that was used by government bodies to make foreign policy decisions such as appointing new ambassadors. The ceiling alone must have weighed thousands and thousands of pounds. I can't begin to imagine how it all stays in place with gravity working against it! 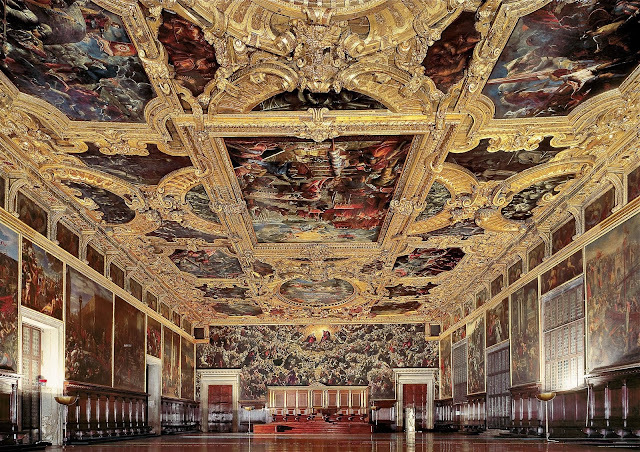 Each and every room in the Doge's Palace is a work of art, filled with actual works of art. So amazing. We crossed over the Bridge of Sighs, and sighed. The bridge passes over the Rio di Palazzo and connects the New Prison to the interrogation rooms in the Doge's Palace. We walked all through the prison - it reminded me of IKEA - huge, tons of rooms, and only one direction, but without shortcuts! Finally we made it back outside. 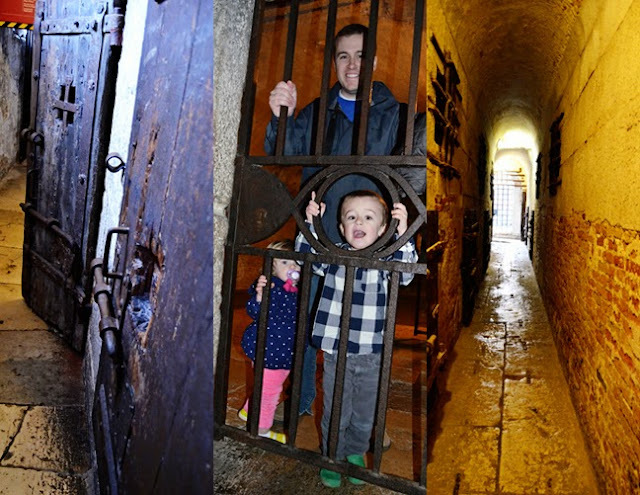 It's crazy to compare the cold, damp, empty, static prison to the overwhelmingly detailed and beautiful Doge's Palace, connected only by a bridge. Lots of symbolism there I tell ya. Our tour of St. Mark's Square was over, so we got back on a boat and crossed over to the La Salute Church. La Salute is a Roman Catholic church and minor basilica. The Salute is part of the parish of the Gesuati and is the most recent of the so-called plague-churches. In 1630 Venice experienced an unusually devastating outbreak of the plague. 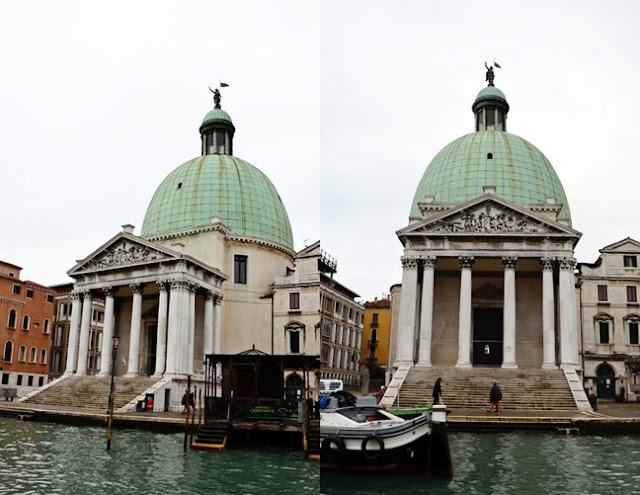 As a votive offering for the city's deliverance from the pestilence, the Republic of Venice vowed to build and dedicate a church to Our Lady of Health (or of Deliverance, Italian: Salute). The church was designed in the then fashionable baroque style by Baldassare Longhena, who studied under the architect Vincenzo Scamozzi. Construction began in 1631. Most of the objects of art housed in the church bear references to the Black Death. The dome of the Salute was an important addition to the Venice skyline and soon became emblematic of the city, inspiring artists like Canaletto, J. M. W. Turner, John Singer Sargent and Francesco Guardi. Back outside we admired the small church next door and then walked down to the old Customs House just to take a few pics. 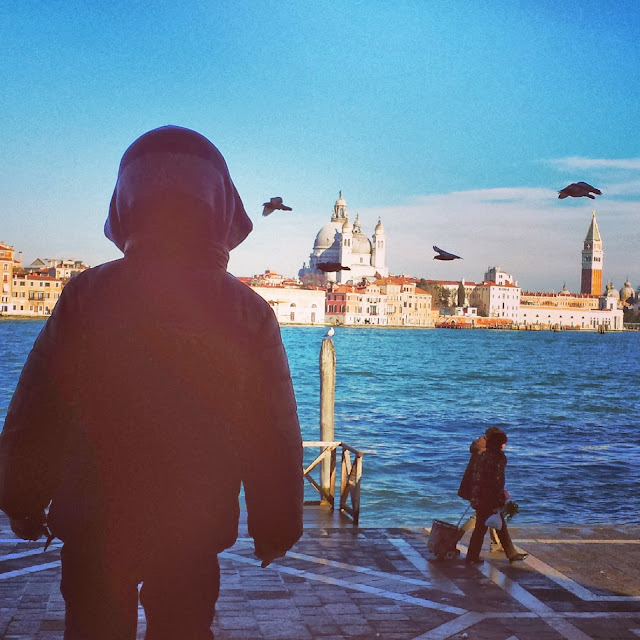 Then we delved into the heart of Venice and crossed over dozens of canals - which, lemme tell you, is no easy feat with a stroller and two children occupying it! They're heavy! 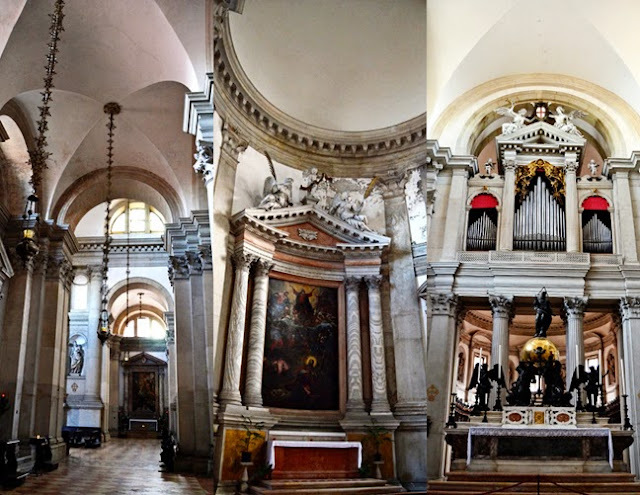 The innards of Venice are beautiful. Totally reminds me of the canals in Venice, California! Then we walked (or rather, climbed) our way over to the Accademia Bridge. The sun was peeking through the clouds making for beautiful lighting of the city. Paige on the Accademia Bridge. Carnival masks are a BIG thing here. We saw hundreds of stands and stores filled to the brim with masks of every kind. 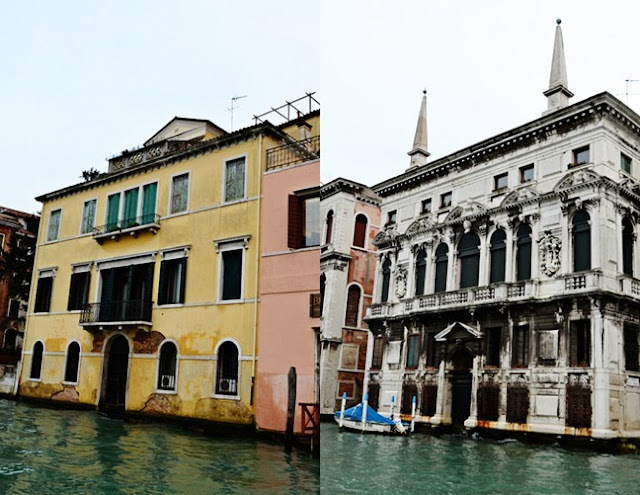 We hopped on a vaporetto and got off at the San Tomà stop to make our way to the Frari Church. The Basilica di Santa Maria Gloriosa dei Frari, usually just called the Frari, is one of the greatest churches in the city and it has the status of a minor basilica. The church is dedicated to the Assumption. The Franciscans were granted land to build a church in 1250 but the building was not completed until 1338. Work almost immediately began on its much larger replacement, the current church, which took over a century to build. The imposing edifice is built of brick and is one of the city's three notable churches built in the Italian Gothic style. 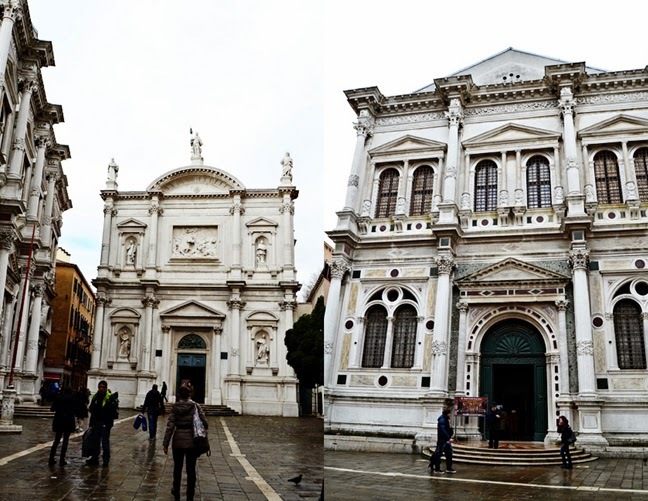 As with many Venetian churches, the exterior is rather plain. 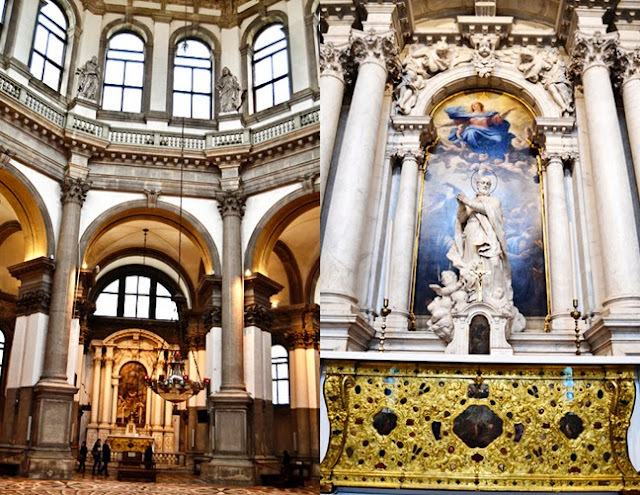 The interior contains the only wood screen (an ornate partition between the chancel and nave of more or less open tracery constructed of wood, stone, or wrought iron) still in place in Venice. Titian, the most important member of the 16th-century Venetian school of painting, is interred in the Frari. There are also works by Donatello and Giovanni Bellini. So many churches! Each one unique and lovely. 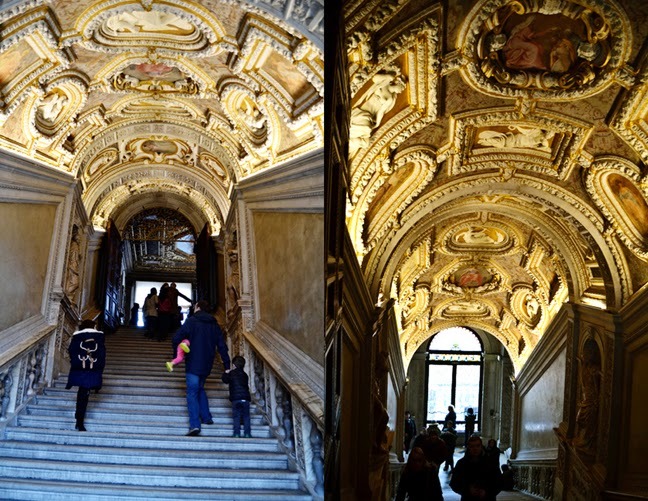 We walked a short ways to the Scuola San Rocco. Sometimes called "Tintoretto's Sistine Chapel", it's a lavish metting hall that has some 50 large, colorful Tintoretto paintings plastered to the walls and ceilings. I got a delicious tomato and mozzarella calzone - yummy! 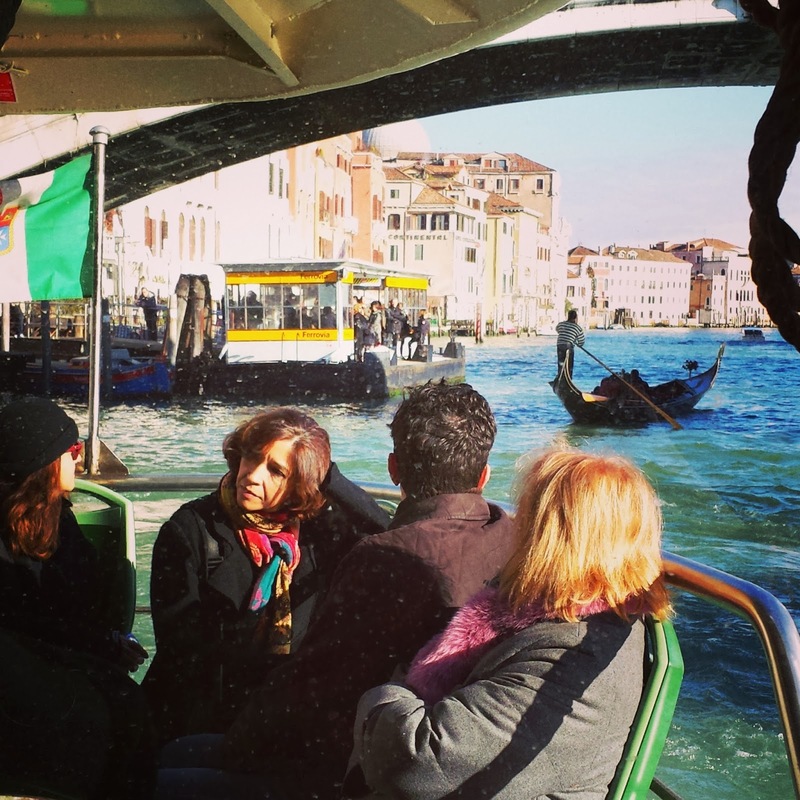 Then we hopped on another vaporetto to the Rialto Bridge to see it up close and in person. I spy myself! One of the world's most famous bridges, this distinctive and dramatic stone structure crosses the Grand Canal with a single confident span. Of course there are tons of stores and markets surrounding the bridge since tourists flock here. The view from the Rialto Bridge over the Grand Canal. The shops behind the Rialto Bridge. We ventured out into the city beyond the bridge and kept running into dead ends. It was fun to walk around and see how locals live. We called it good for the day and headed back to the Tronchetto parking garage. Fox and I sat in the front to get some good views. This time I put my camera away (for the most part, ha) so I could soak it all in. We took the fast boat all the way to St. Mark's Square. We walked straight back to the Church of San Zaccaria. San Zaccaria is dedicated to St. Zacharias, the father of John the Baptist, whose body it supposedly contains. The present church was built in a mixture of Gothic and Renaissance styles between 1458 and 1515. Antonio Gambello was the original architect, who started the building in the Gothic style, but the upper part of the facade and the upper parts of the interior were completed by Mauro Codussi in early Renaissance style. 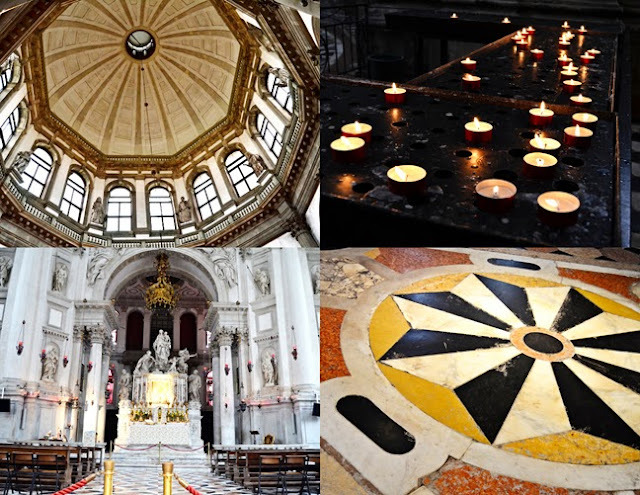 The first church on the site was founded by Doge Giustiniano Participazio in the 9th century and eight doges are buried in the still existing crypt. The original Romanesque church was rebuilt in the 1170s and was replaced by a Gothic church in the 14th century. 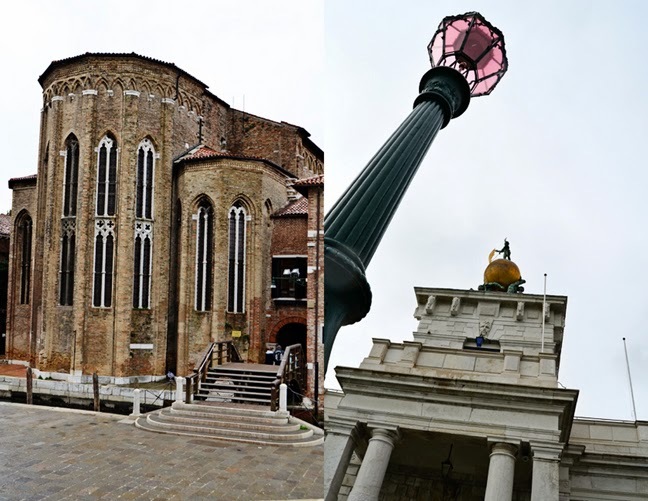 The church was attached to a Benedictine monastery, which was visited by the doge annually at Easter in a ceremony which included presentation of the cornu (ducal cap). This tradition was begun after the monks donated land for the extension of the Piazza San Marco in the 12th century. The interior of the church has an apse surrounded by an ambulatory lit by tall Gothic windows, a typical feature of Northern European church architecture which is unique in Venice. 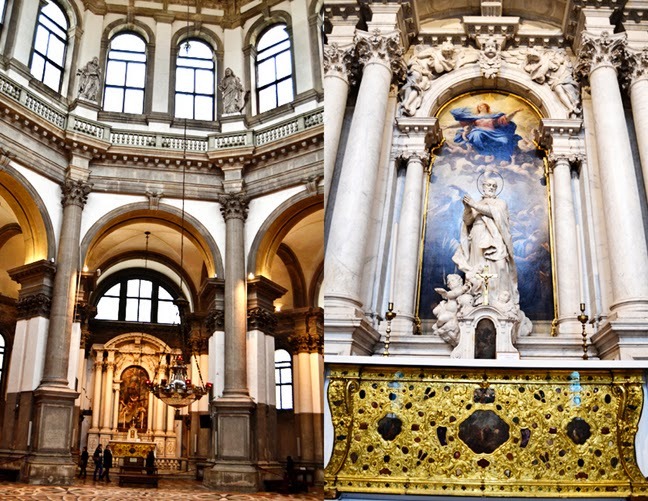 The church houses one of the most famous work by Giovanni Bellini, the San Zaccaria Altarpiece. The walls of the aisles are entirely covered with paintings by other artists including Tintoretto, Angelo Trevisani, Giuseppe Salviati, Antonio Balestra, Giovanni Domenico Tiepolo, Palma the Elder and Van Dyck. 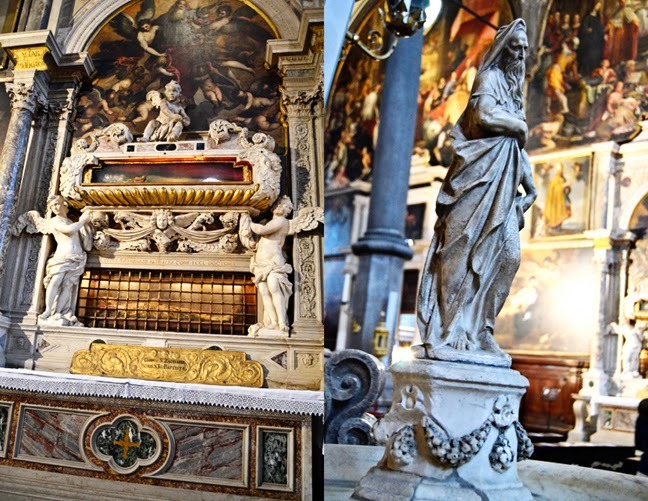 The artist Alessandro Vittoria is buried in the church, his tomb marked by a self-portrait bust. Then we took a boat across the lagoon to San Giorgio Maggiore island. Inside the Church of San Giorgio Maggiore. San Giorgio Maggiore is a 16th-century Benedictine church designed by Andrea Palladio and built between 1566 and 1610. 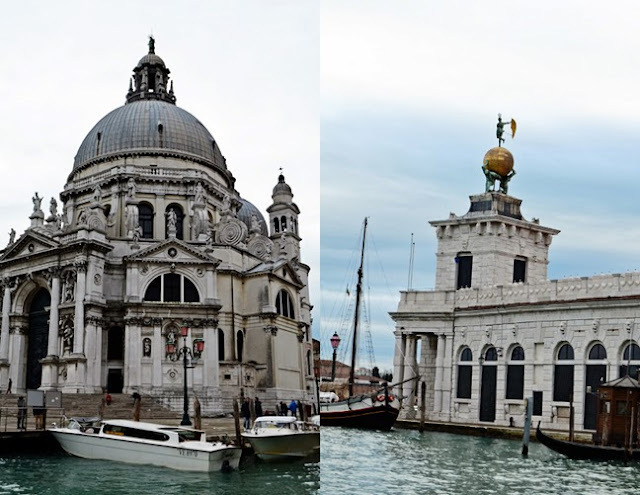 The church is a basilica in the classical renaissance style and its brilliant white marble gleams above the blue water of the lagoon opposite the Piazzetta and forms the focal point of the view from every part of the Riva degli Schiavoni. Two very large paintings by Tintoretto relate to the institution of the eucharist and are placed on either side of the presbytery where they can be seen from the altar rail. These are The Last Supper and The Fall of Manna (which was considered as a gift of God foretelling the gift of the eucharist). Leaning towers are a thing in Italy (think: Pisa). 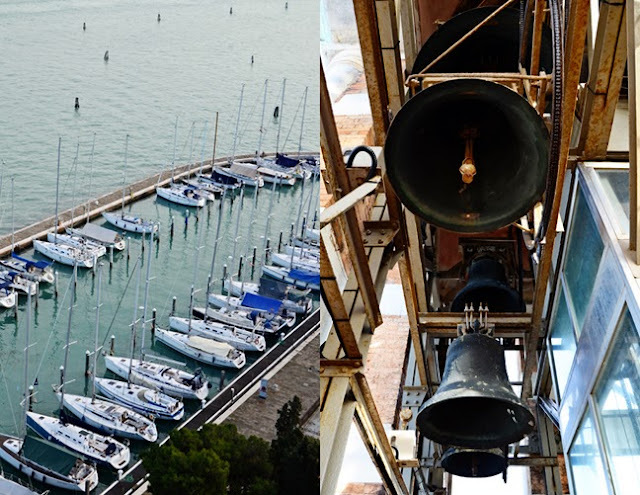 / Then we went up to the bell tower of the San Giorgio Maggiore Church. More incredible views of Venice! Here's looking out to St. Mark's Square. That was all to see and do on San Giorgio Maggiore so we hopped on the vaporetto to the next stop at La Guidecca Island. We walked around and just enjoyed our time in Venice. 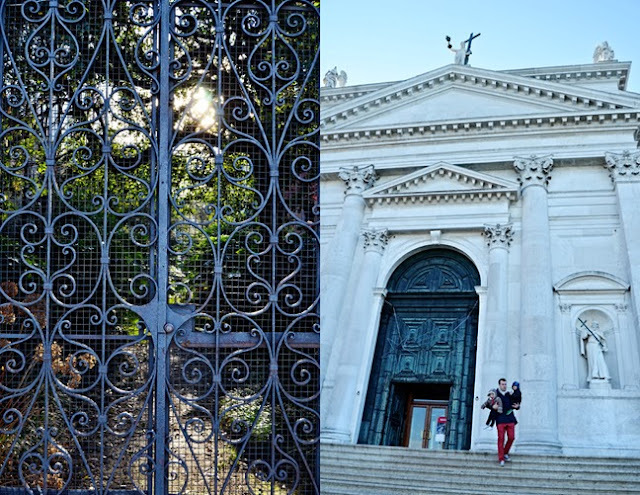 We stopped at the Redentore Church, but it was expensive to go in, so we just admired the exterior. Fox took this little Pooh bear figurine all around Venice and did this funny thing of setting it down everywhere and making me look at it. Fox on the steps of the Redentore Church, looking out to St. Mark's Square. 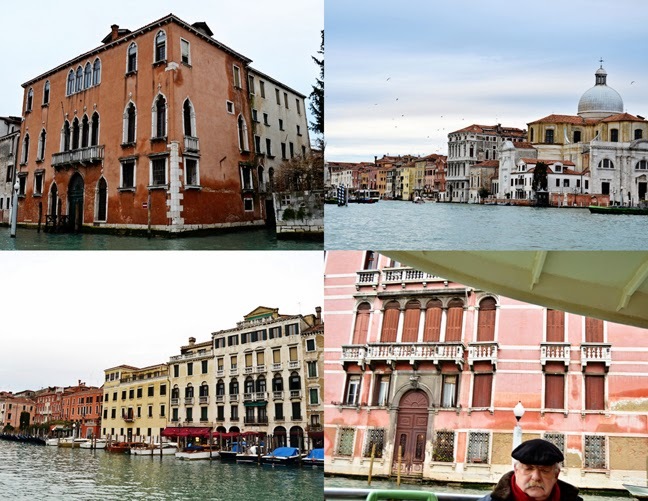 More pics from our walk along La Guidecca Island. Fox and Jane having the time of their lives. I do hope they remember this. We hopped back on the boat and took the long way back to the car so we could soak in one last look of Venice. I hope we meet again Venice - you are my favorite city in the whole wide world! Loved the trip and love the post! 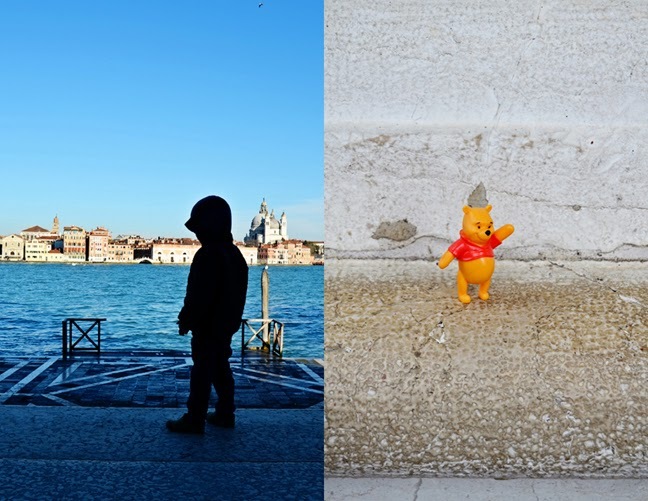 Venice really is all it's cracked up to be! It is just gorgeous. For me, it is like you said a dream that probably will not happen. Going to Venice in Cali is a lot more attainable. LOL So, thank you, for sharing your photos. Italy is just beautiful. Between you and Steph... I am loving living vicariously through you both. I loved Venice too! If you guys get a chance Verona was one of my favorite cities too. Such a sweet quaint town!! WOW! What an amazing adventure! Gorgeous photos of a gorgeous city. You are so lucky, Paigerini! I am glad I can see this through your eyes. Amazing!! So glad y'all have been able to go. What amazing memories!! Thanks for the Venetian tour! So lovely!